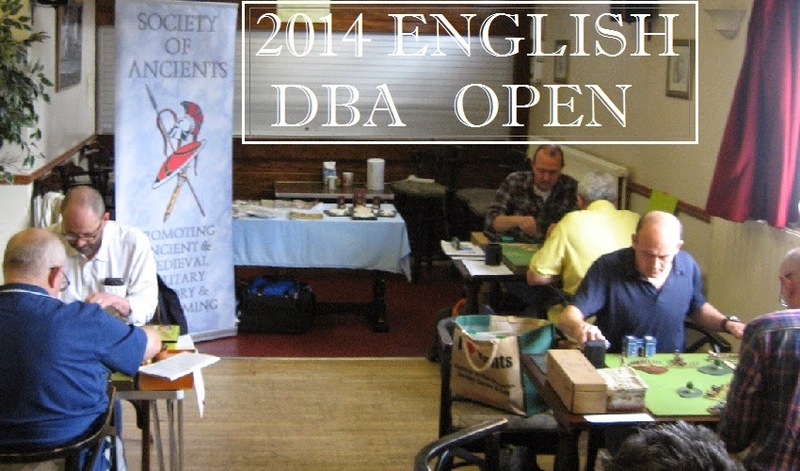 The Open is a one-day DBA event ... take any army you like but the players will then be arbitrarily pooled by date. After a round robin of pool games, the winners and runners up go forward to a knock out scramble for the trophies. 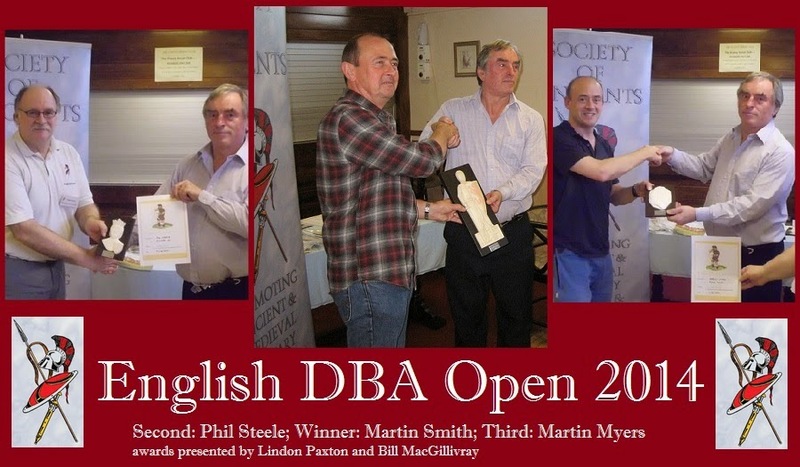 In addition, the Open was the last round of the Society of Ancients UK DBA League - with some positions still in doubt on the day pending the open scores. So two sets of trophies come day's end. 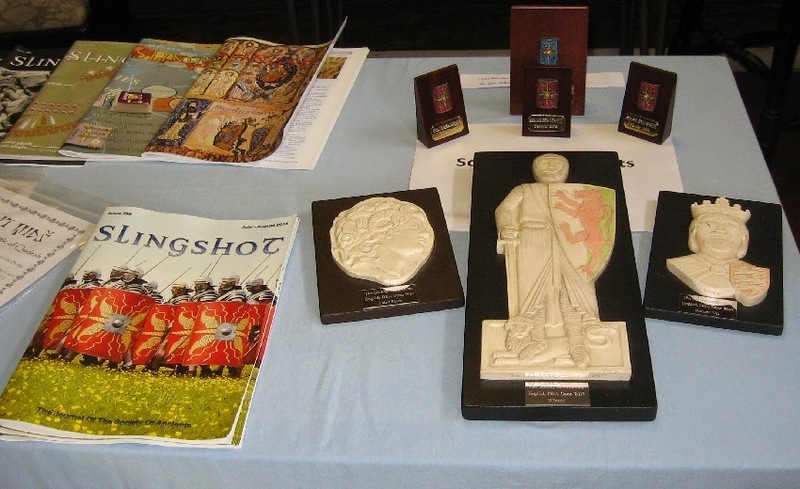 I do hope you like the shields ... these are hand cast and embellished in Northamptonshire and are unique to the Society. 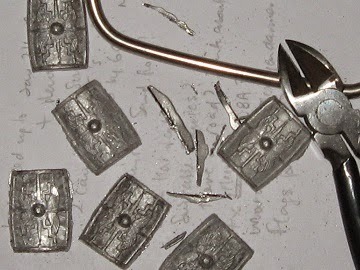 In this case a number of ugly old figures, miscasts and off cuts were melted down and recycled. 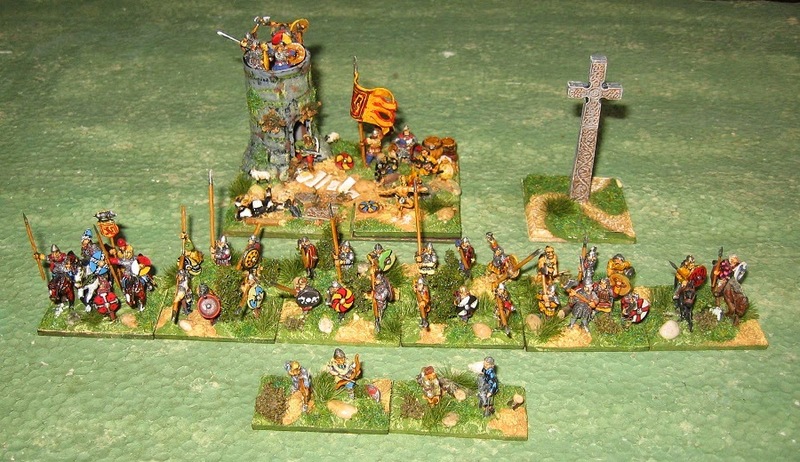 As many of you know, I have a soft spot for old figures so rest assured no classics are being lost to posterity in this process - indeed I hope it is a sort of Valhalla for yesterday's misshapen and abandoned warriors. 3Kn Gen, 1 x 2LH, 1 x 4Wb, 6 x 3Sp, 1 x 3Wb, 2 x 2ps. These are the rest of some bags of Peter Pig Vikings and samples from other manufacturers which I put together for a Slingshot review. 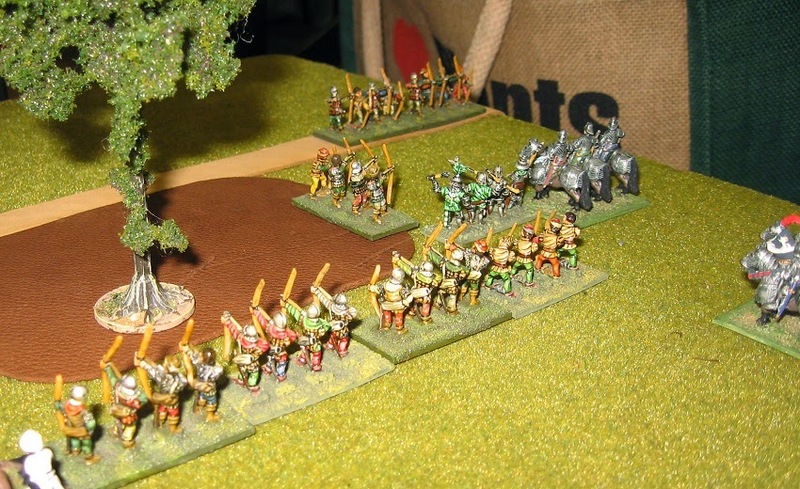 I had them just about ready for Portsmouth - they will have a few clumps of heather added to their bases when I find where I have put the little bag. 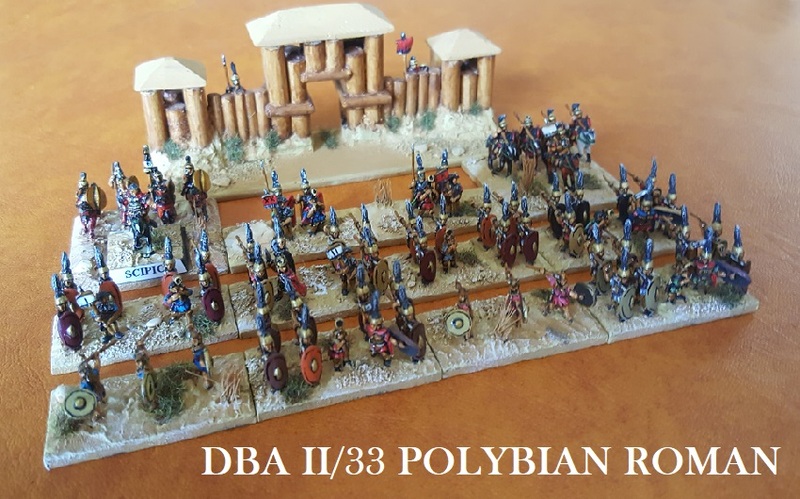 The only fiddling - other than mixing in the different makes - was lengthening a few of the spears: this army will become '3Pk' under V3 (and lose a Ps for a Sp or Wb) and I wanted it ready for the new version. 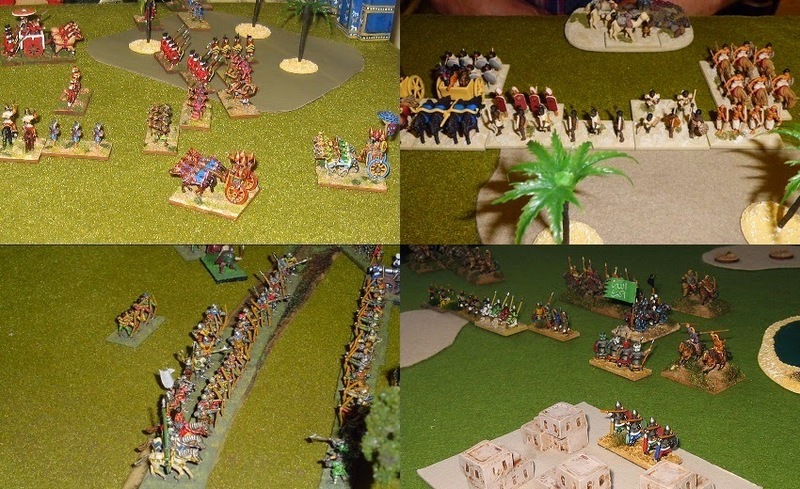 In my 'AD' pool I got Mongols, Samanids, French Ordonnance, Magyar and a cross-over tussle with Babylonians ... a challenging series of opponents but not bad for an Open competition. 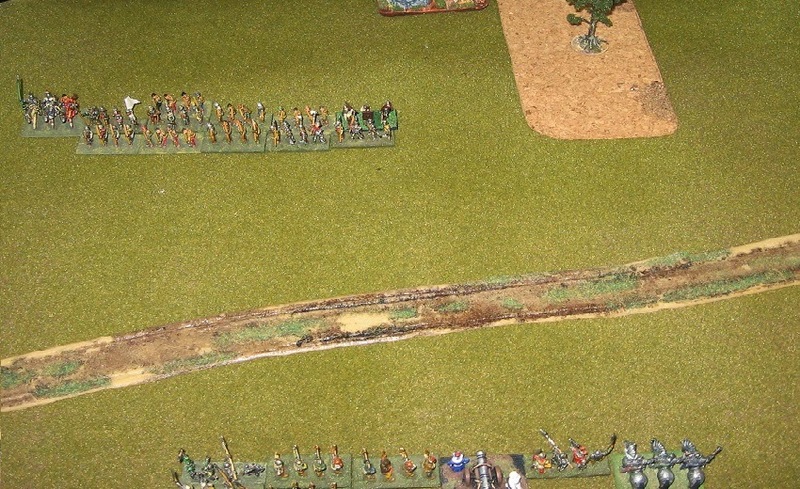 With all those LH my main plan was to channel the enemy with woods, back up my flanks and close the enemy down as rapidly as I could. Attack rather than defend if there was any choice at all. 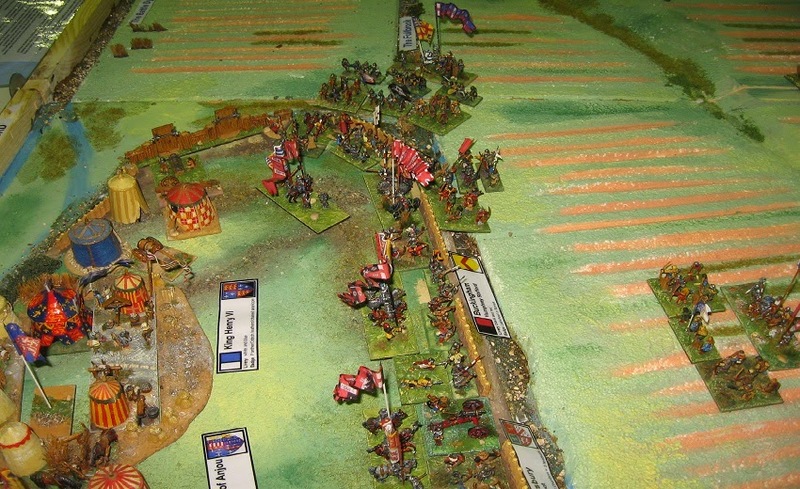 Even so, the plucky Scots topped the pool and thrust me into the semis. 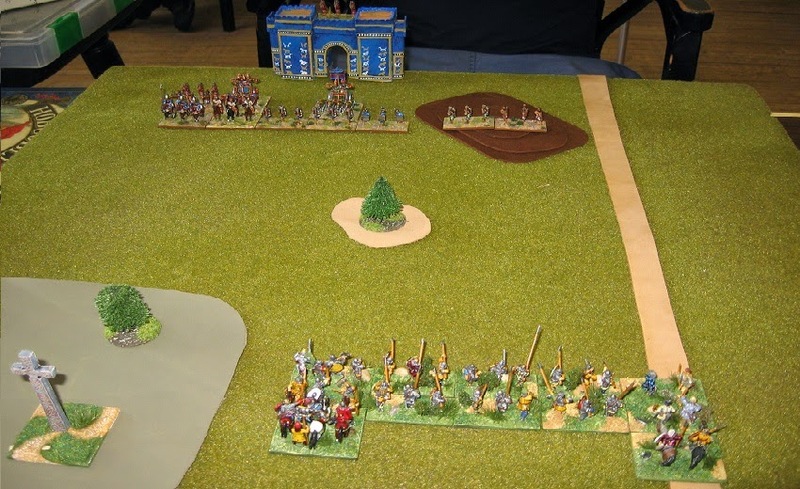 So choices over ... the format for the final phase of the Open is for all 4 players to take the same army (in this case Wars of the Roses, although options could be chosen). 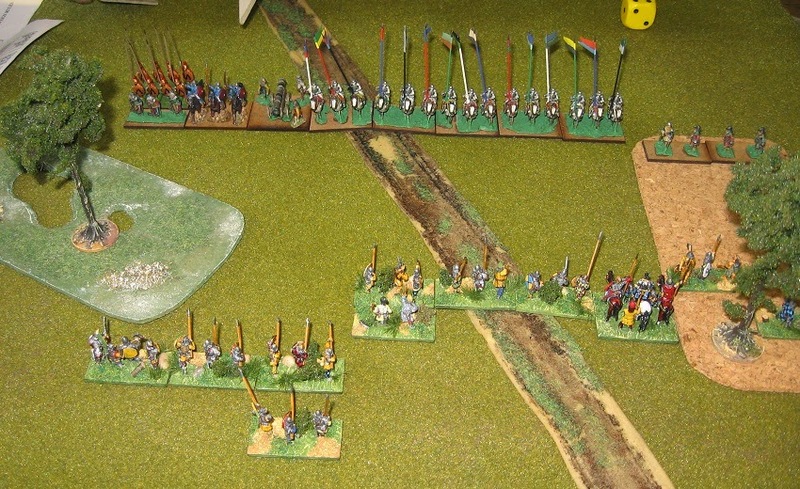 Then I got unlucky and came Second - Game over. Many thanks to Bill, Lindon and the Portsmouth club for their customary first class organisation (and a new venue that was easy to find) and to Martin for the extra photographs. 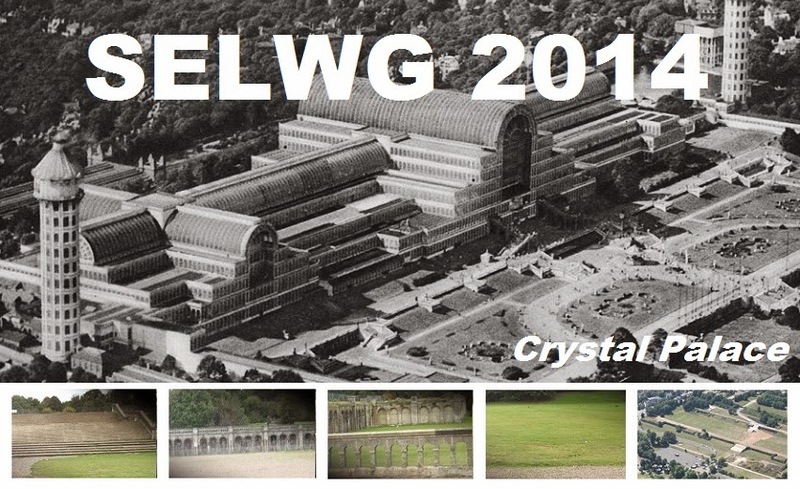 So, in all the years I've been going to SELWG*, I've never said anything about the Crystal Palace, after which the park in which the SELWG venue stands, takes its name. The Crystal Palace, of course, was the poetic name given to the truly vast glass and metal pavilion built in Hyde Park to hold the Great Exhibition of 1851. At the time it was the biggest glass building ever erected and was a wonder of the industrial world. Just look at the size of it. 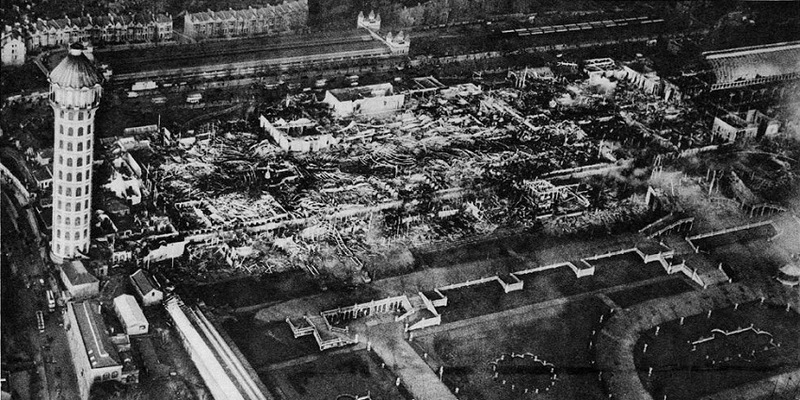 After the exhibition, it was disassembled and moved 8 miles away, south of the river, to a specially terraced hilltop in leafy Sydenham. Piece by piece. What a triumph. Click on it. Astonishing. Today all that remains is the stonework of the terracing - epic, like the ruined centre of an ancient city - and the name, a permanent fact of London's geography. 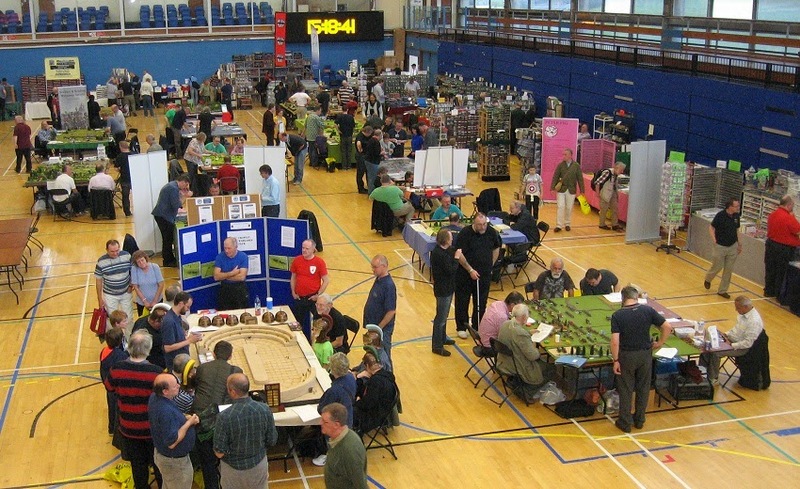 It is a fantastic venue for a wargames show and has free parking. There was even a funfair on the old exhibition site but I did need to get home after the show. 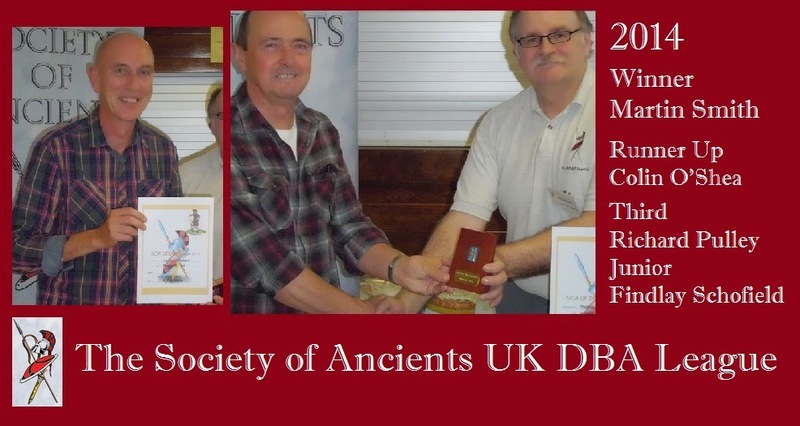 I was down to help out on the Society of Ancients stand, and to collect trophies to take along to the next weekend's national DBA event (just gone, by the time you will read this). 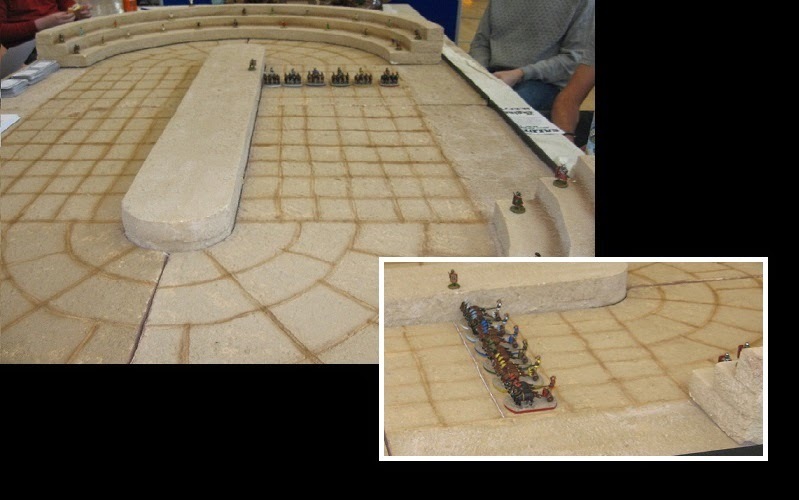 Downstairs, there were permanent clusters around the chariot race and Simon Miller's (To the Strongest) Romans in Britain game. Another good show - thanks to all those contributors whose work is featured above and to everyone who supported the show. 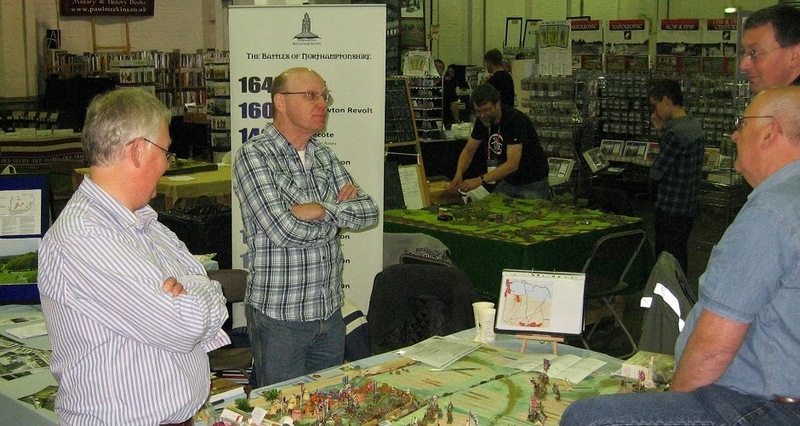 By and large an entirely different selection of games and themes to Derby - so certainly worth the trip. 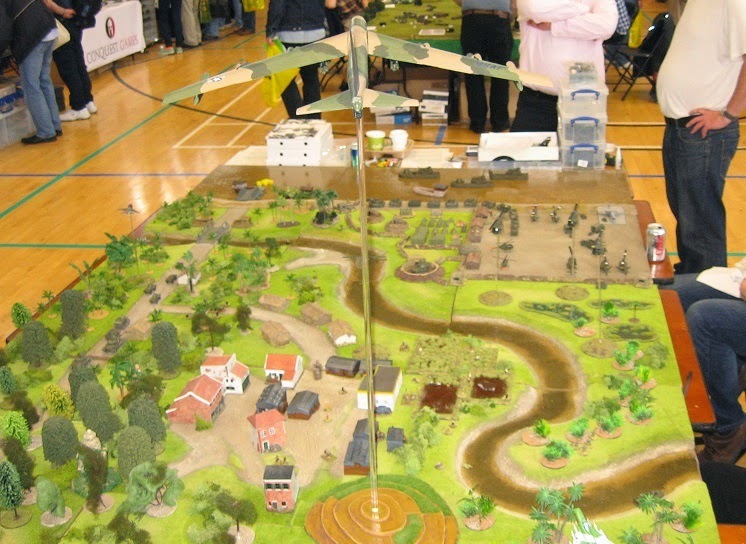 Thanks to SELWG for inviting us and whoever organised the weather so it didn't rain all day. 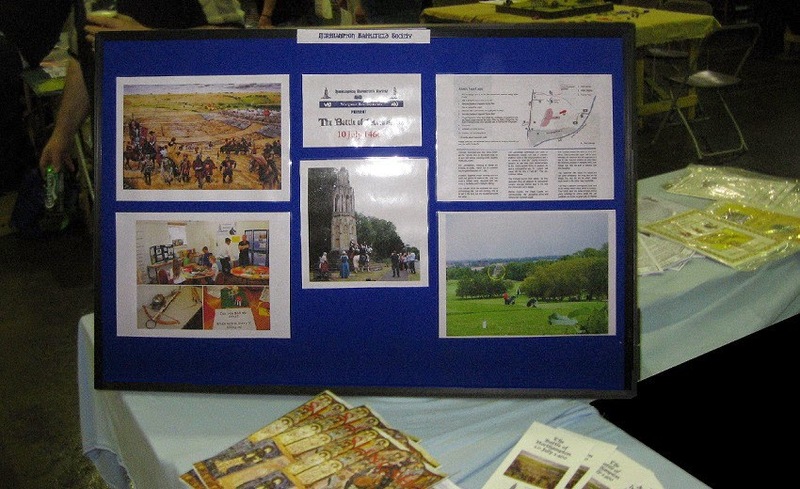 And an engaging variety of visitors chatting to us on the Society stand - thanks for stopping by. Also apologies to anyone we failed to notice or who we thought was happy browsing but actually wanted to talk to us. I know this does happen despite our best efforts to pay attention. It isn't intentional so do feel invited to give us a nudge. 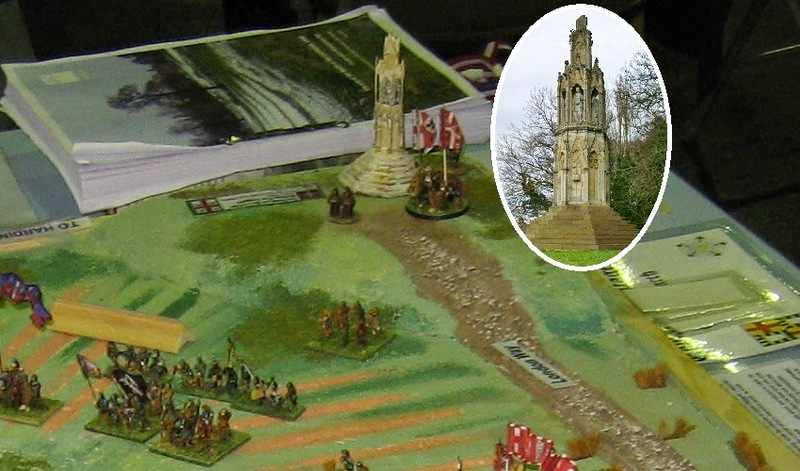 This outing, we took the Northampton battlefield presentation along to Derby's annual event as a Participation Game for up to 4 players based on the Society of Ancients classic De Matrica Bellae. 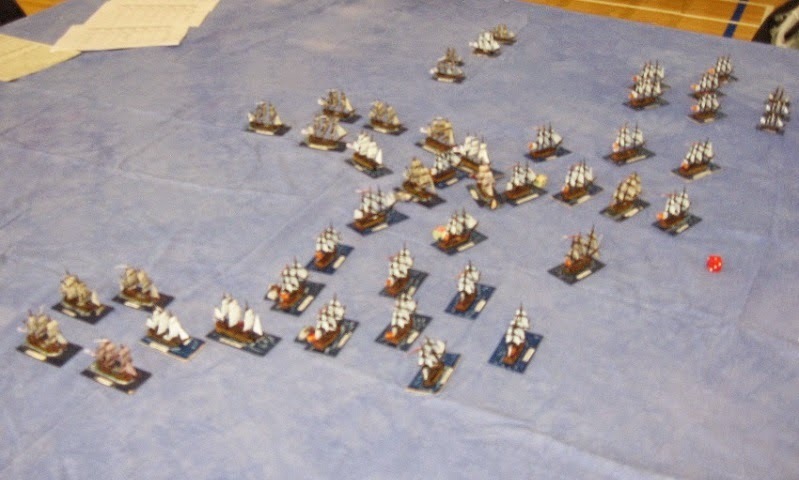 In this variant of Politics by Other Means, players are given cards which they can use in building their narrative into what starts as a very basic figure wargame. 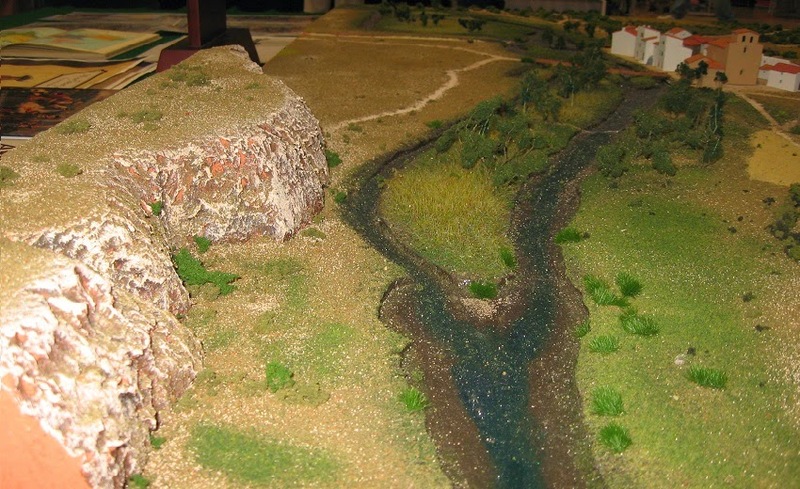 This means really quite sophisticated ideas can be woven into the game if that is how the players see it developing. It is your game ... you decide what happens. 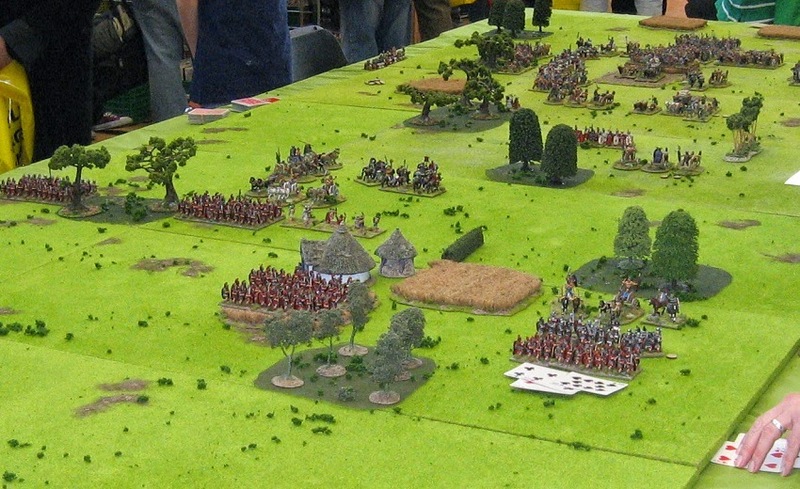 By an odd coincidence, the Border Reivers game on the next table to us was using a similar, if simplified, matrix game approach inspired by the same SoA Publication to run their cattle raiding game. 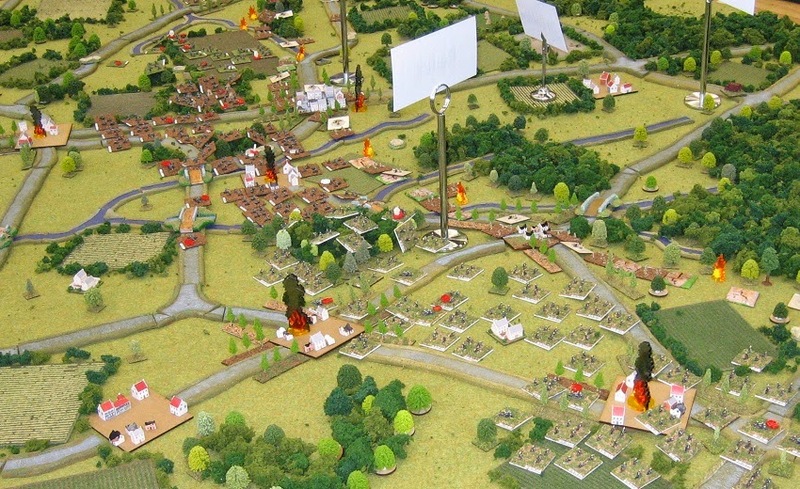 As well as the rules and cards for DMB, the games pack also contains a full multi-player map game, Londinium's Burning. If you are lucky, there may be some stocks left at the Society webstore otherwise catch up with us at a show (we should be able to find a copy). So ... 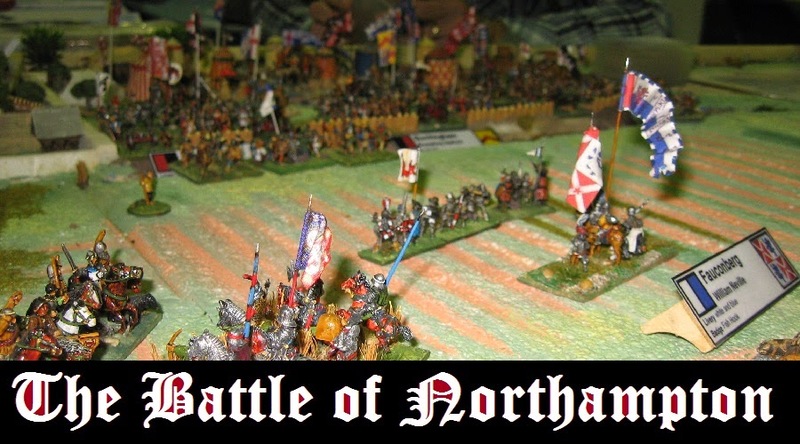 The Northampton Battlefields Society was formed to research, explain and protect Northampton's battlefields - principally the 1460 site at Delapre Abbey, but also the other military history of the town and the further off Wars of the Roses battlefield at Edgecote. 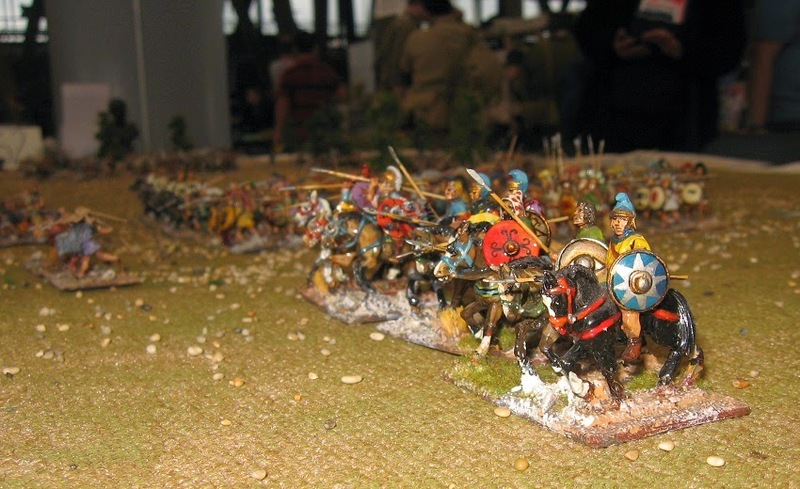 Neither battlefield has been archaeologically surveyed so there is much more to do to understand them. At Delapre (a park just on the edge of the town if you are not familiar with it: it is a couple of minutes off the A45, and has plenty of free parking so is one of the easier battlefields to visit) there are plans to establish football pitches and club buildings on part of the English Heritage designated area so we must be vigilant. 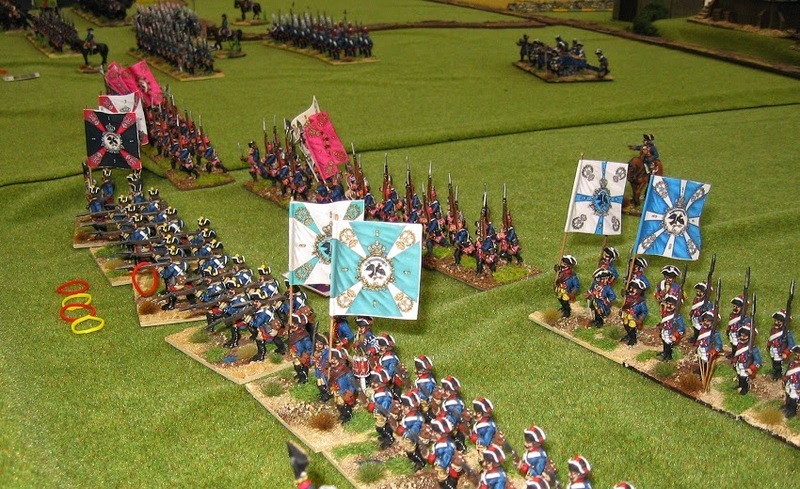 Edgecote is on the route of HS2, so we must do what we can to preserve as much of the elusive battlefield for posterity as we can. 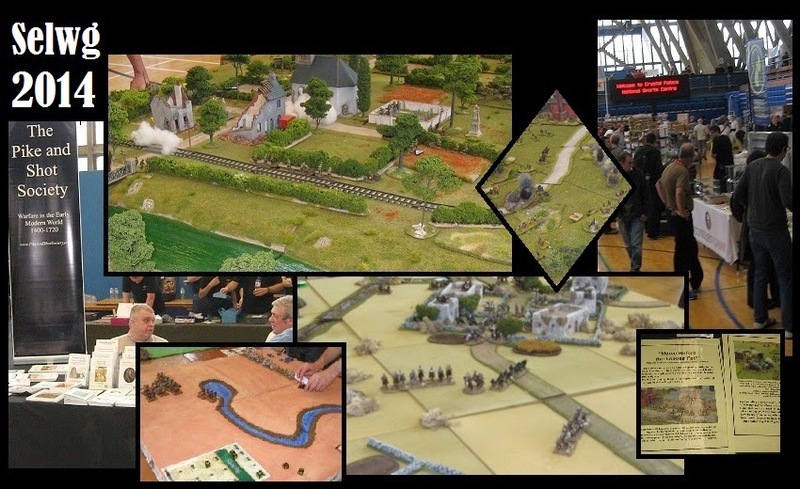 Wargame Developments is, of course, the host organisation for the Conference of Wargamers. 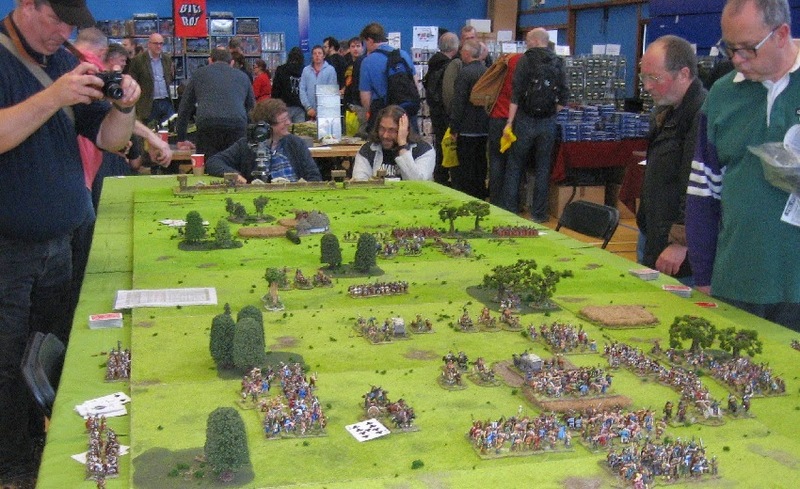 By coincidence also in Northamptonshire, CoW can play an invaluable role in developing and testing wargames and approaches to historical battles. 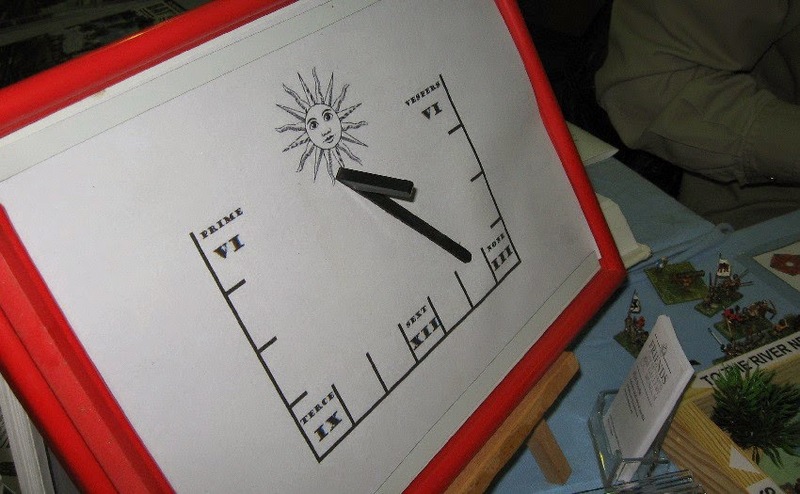 Ideas such as running the game to the canonical hours being rung in the abbey come straight from CoW and have been incorporated into the design of my sundial game clock. 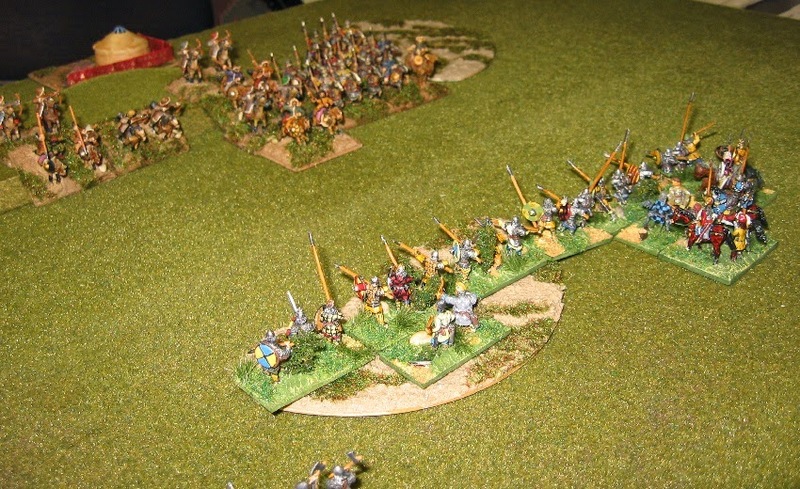 At CoW we also decided to use the furlongs of the open fields as the measurement for the game mechanism (and coincidentally, effective range for a longbow is a furlong, so using contemporary measurements does seem useful). 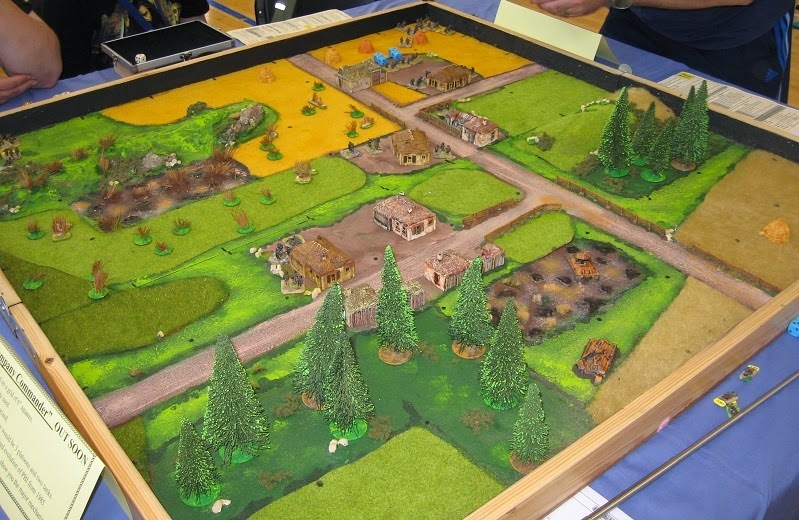 Nevertheless, it was quite ambitious running a matrix game at a busy and noisy show like Derby, so we had to learn as we went. 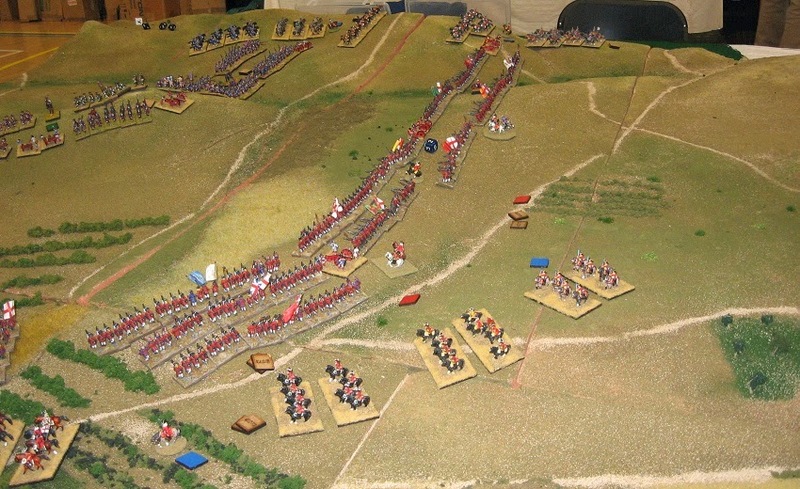 At times we may have got the balance of attention wrong - perhaps not giving enough to the casual browser ... then again getting distracted from the game which needs some thought and which needs to push along. 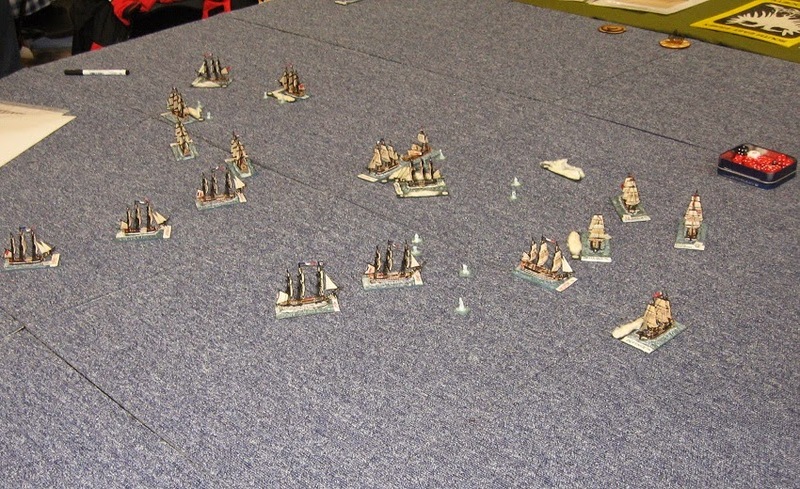 We got two multiplayer games played and a one player aside blitz version, and the possibilities developed as we warmed to the task. 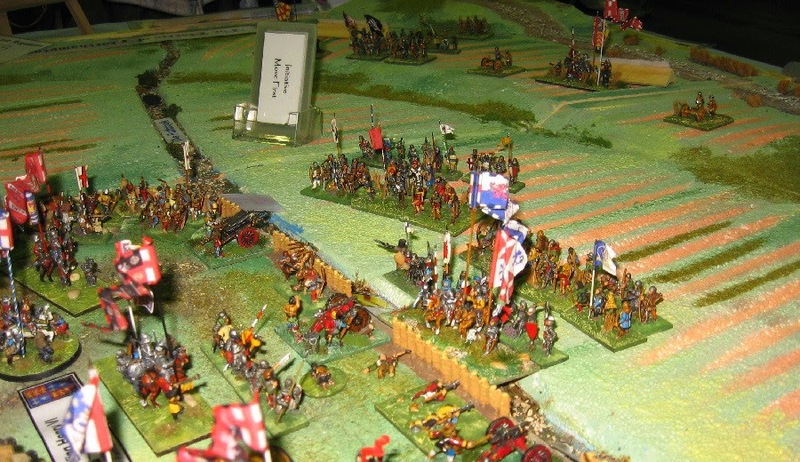 A number of historical possibilities were explored - but in 2 of the 3 games the Yorkists got into the Lancastrian position, fulfilling the criteria for a historical result. 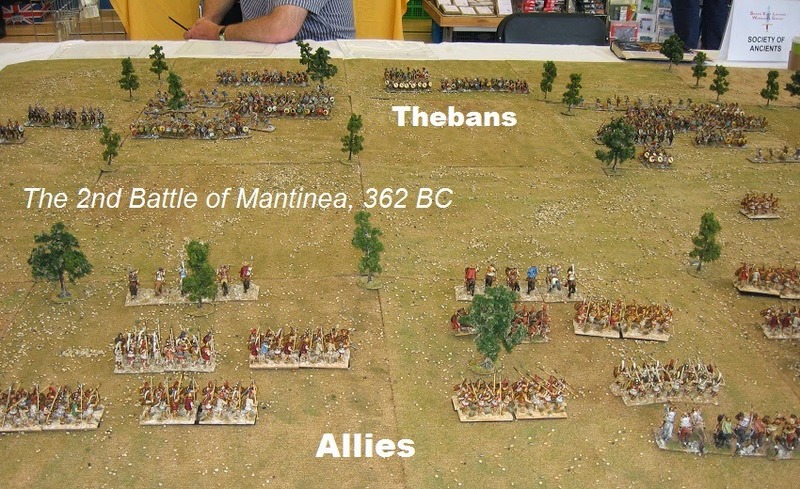 In De Matrica Bellae, the final phase is that every player gets to make a case as to why the won i.e. bearing in mind their briefing and the events of the game, why they did the best. 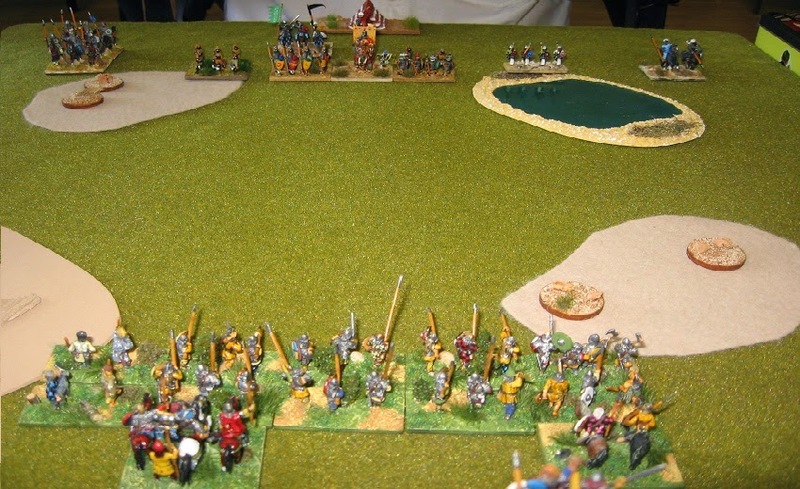 So the loser of the on table battle may well be judged the player who did best if they can make a sufficiently powerful case. The choice of winner is, of course, resolved by the Matrix argument ... it will be adjudged 'your day' because (3 reasons supported by a randomly drawn card) ... judged on strength by the Umpire (equals a die score on D6 you need to make or exceed) ... 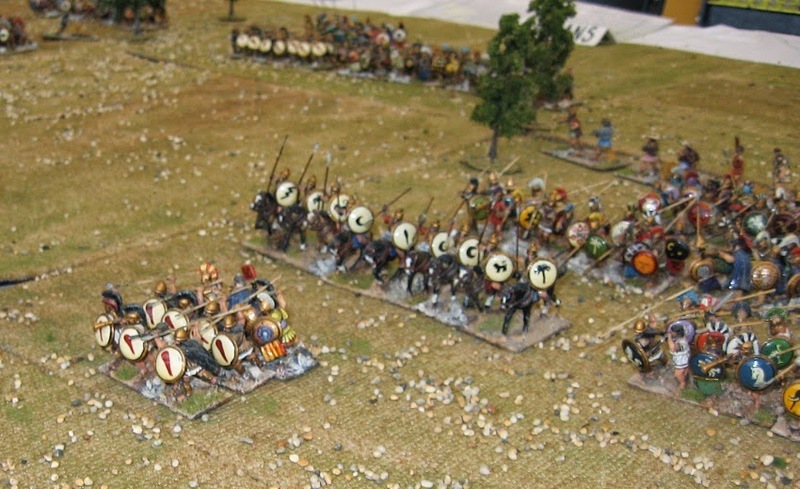 The player who exceeds the target by the most is the winner (so an outstanding argument and a good die roll are required - wargaming at its purest perhaps). 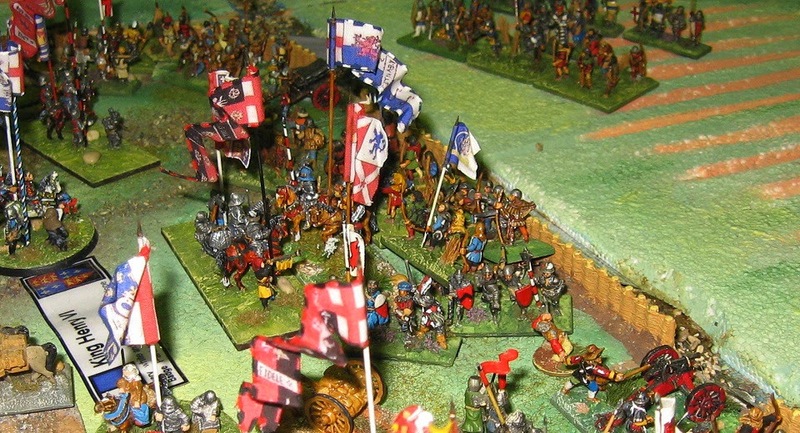 In the meantime, of course, we were also trying to interest casual browsers in the issues of the battle, explain the history and possibly recruit new supporters. All in all, a very rewarding outing ... it seemed to fly by and thankfully the shows are coming thick and fast as I already know there was plenty of shopping I needed to do but hadn't made a list. Great making some new plans with Warbases. 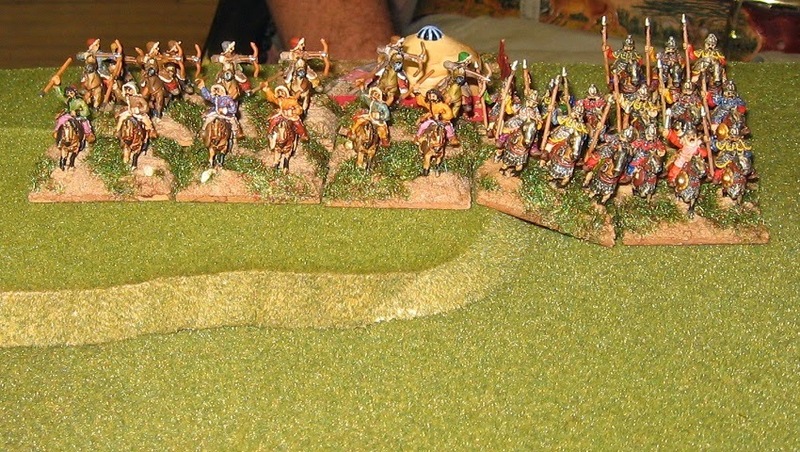 And great meeting up with the Armati players for the first time in a while. Many thanks to players and supporters ... thanks to the organisers for allocating us plenty of space - and thanks to everyone who helped.